One of my favorite foods to experiment with is flour tortillas. Like you, I have them on hand for tacos and wraps, but did you know they also make a superb base for quick pizzas? They're so fast and easy to make that they are perfect when the munchies hit and you want a tasty snack. 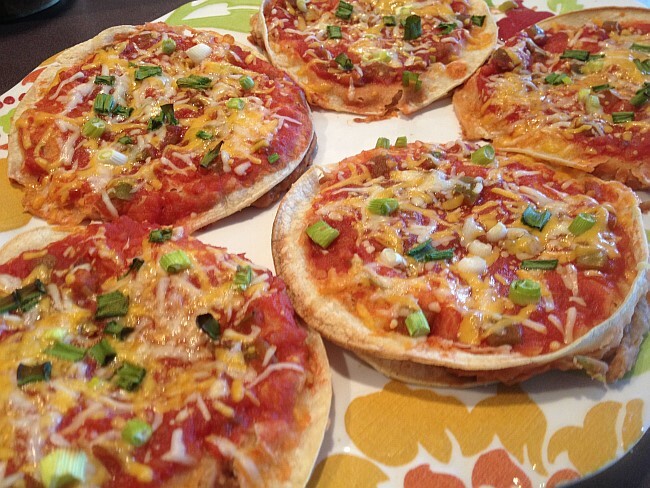 And they're also hearty, so tortilla pizzas are perfect for dinner as well. Preheat oven to 400°F. 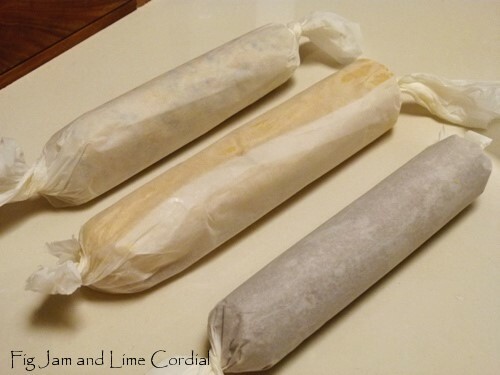 Lay tortillas in a single layer on baking sheets and place in the oven for 2 minutes. Turn and spread sauce evenly over each tortilla. Sprinkle evenly with mozzarella cheese, mushrooms, pepper dices, and Parmesan cheese. Return to oven for 5 minutes or until cheese is bubbly. Cut each tortilla into 8 wedges using a pizza wheel or kitchen shears. Sticking with the tortilla theme, I also turn to a baked tortilla pie quite often. This vegetarian pie is an easy way to eat your rice and beans. It takes a little longer to make than the pizza crisps, but oh it's worth it. Topped with avocados, sour cream, and any other garnish you'd like, it's an easy dish that can be used to get rid of any leftovers in your fridge, too. And it's so good that I've even taken this to church potlucks. Preheat oven to 350°F. Butter the bottoms and sides of a baking dish, which optimally should be the same size as your tortillas. In my case this wasn't possible, so I just origami-style folded my tortillas to fit. Butter and place one tortilla on the bottom of the pie dish, and sprinkle some cheese over it. 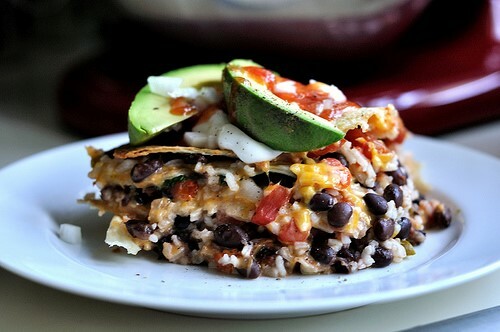 Add a layer of each filling ingredient (cheese, rice, beans, spinach, tomatoes, corn, onions, chilis, and peppers) and continue buttering each tortilla and layering ingredients. You can go as high as you want, we stopped at four layers. Don't forget to season each layer with a bit of chili powder! Top off your layers with one last flour tortilla. Spread a little butter over the surface of this tortilla. Cover the dish with aluminum foil. Bake in oven for 30 minutes at 350°F. Remove the foil and crank the temperature to 400°F. 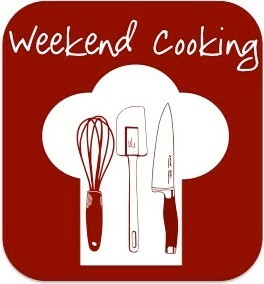 Cook for 15-20 minutes, until the top is lightly browned and cheese is bubbly. Remove from oven. Let stand for 10 minutes. Cut into quarters. Serve with chopped avocados, cilantro, salsa, and/or sour cream. Besides tortillas, I really like messing around with pasta. One of my favorite experiments that is now popularly called "Lasagne Cupcakes" is something I came up with about 10 years ago. I had no idea I was ahead of any food trend. Now muffin tins are used for all sorts of things besides muffins. For instance, one day I didn't have anything in stock but cheese, milk, basil, and elbow macaroni. So I made macaroni and cheese cupcakes. Instead of baking your mac 'n cheese in a casserole dish, you divide your recipe into muffin cups and bake. They were so good! 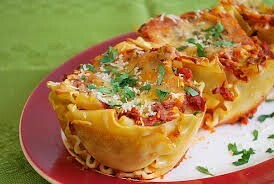 But back to the Lasagne Cupcakes. Like Pizza Crisps, they are fast and easy to make. They only take 15 minutes to prep and just 35 minutes to bake. And they're also versatile. Preheat oven to 375ºF. Spray muffin tin with cooking spray. Cook lasagna noodles until barely tender. Drain and lay flat on parchment or waxed paper. When cool enough to handle, cut each noodle into 2 lengths. Line each muffin cup with a noodle; cut a small piece of the overlapping noodle to place in the bottom of the muffin cup. As noodles are cooking, brown beef, and season with salt and pepper. Drain. Reserve 3/4 cup Parmesan cheese and 3/4 cup mozzarella cheese for the top of your cupcakes. Start layering your lasagna cupcakes. Sprinkle a little Parmesan cheese, ricotta cheese, and mozzarella cheese in each muffin cup. Top with a little meat and pasta sauce. Repeat layers again (Parmesan, ricotta, mozzarella and pasta sauce). Top with reserved Parmesan and mozzarella cheeses. Bake for 18-20 minutes or until edges are brown. Remove from oven and let cool for 5 minutes. To remove, use a knife to loosen the edges, then pop each lasagna out. Garnish with basil and serve. Well, whatever you're making this weekend, do a little experimenting; and don't forget to share for a nice change of pace.